The rubble after an explosion destroyed the downtown Durham building. "Engine company captain of Engine 1 did order an evacuation to the store owner and the people working, and having coffee inside," Durham Fire Chief Robert Zoldos said at a Thursday afternoon press conference. "All the people in the business did evacuate other than the owner. The owner decided that he did not want to evacuate. Our engine captain went to find a police officer to enforce that evacuation order, and that is when the building exploded and collapsed." 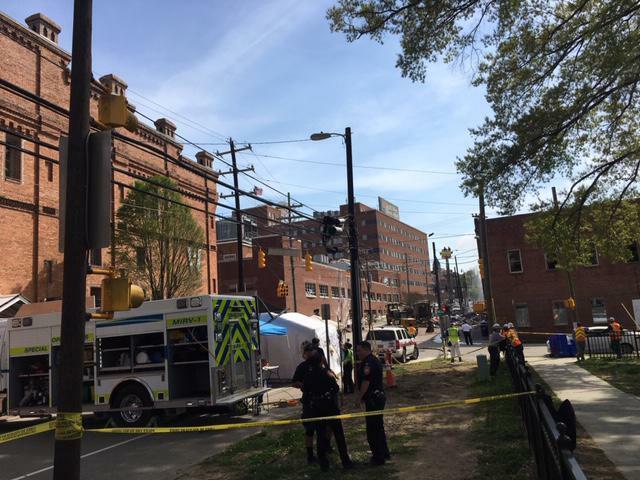 WUNC's Jason deBruyn joins Frank Stasio on The State of Things to discuss the latest on the downtown Durham explosion. A precise evacuation timeline isn't known, but Zoldos said it was after 10 a.m. that fire personnel ordered those in the coffee shop to evacuate. The explosion occured at 10:07 a.m.
Police said Kaffeinate coffee shop owner Kong Lee, 61, was the only person killed in the blast that leveled the century-old building. The coffee shop was on the building's ground floor. The second floor is occupied by Prescient, a design and construction company. Prescient chairman Satyen Patel said Wednesday that all of his employees evacuated safely. Zoldos said Thursday that firefighters told people in the coffee shop to evacuate and got about 10 customers out, but Lee apparently lingered and was last seen in the doorway. "We spoke with everyone inside his business including him and said that we were recommending evacuation of the structure, and we got everyone else out but him," he said, adding that the captain was still emotionally shaken from the experience. Zoldos said some of his firefighters continued to work the scene after suffering cuts from flying debris or other injuries from "the concussion of the blast wave." One firefighter - Darren Wheeler - sustained critital injuries and was still recovering in the hosptial as of Thursday evening. The other eight firefiighters who were transported to hospital after the explosion had been released by Thursday evening. A gas leak had been reported about a half-hour before the blast Wednesday morning, and firefighters were working to get people out of nearby buildings. City officials released details about what contractors had permits to work in the area. Contractors included Fibertech Networks, which is owned by Crown Castle. That company hired a contractor who was installing fiber in the area prior to the incident. "We are devastated by this tragic event and its impact on the Durham community," according to a statement released by Crown Castle area president Cathy Piche. "We grieve the loss of life and our continued prayers go out to the people who were injured and their families. We are grateful for the first responders whose brave actions saved lives. … We have offered our full support and cooperation to Durham city officials. We are committed to working with the Mayor's office to help the community recover." On Thursday, 21c Museum Hotel Durham was evacuated after reports of a gas odor there. Firefighters inspected the building and did not detect dangerous gasses. There were no injuries. 21c Museum Hotel Durham was evacuated for a short time Thursday afternoon as fire crews searched the building but did not find dangerous gasses. There were no injuries.